The first time I saw Martin Samuelsen my first reaction was: “Your Mum should not allow you out after dark!” So youthful was Samuelsen’s appearance but make no mistake about it, Martin Samuelsen’s football pedigree is first class. It is easy to see why the supremely talented Samuelsen, was so sought after as a young prodigy. The likes of Chelsea, Real Madrid were all after the young Norwegian international. Someone of Samuelsen’s natural ability, need very little coaching, it is more a case of guiding them. Football at its best, is a game of beauty and intelligence, artistry over brawn. That personifies Martin Samuelsen at his best. The elegant Samuelsen, can play anywhere across the middle, as well as the classic number 9 or 10. Although I will confess, I never tire of watching his goal against Sheffield United, while on loan for Peterborough. Samuelsen, cuts in from the left, turns the Sheffield United defence inside out then BANG! In the far corner of the net goes the ball! Poetry in motion! A West Ham player if ever I’ve seen one! It was Yossi Benayoun, who once said “I need to feel the ball”, likewise with Samuelsen. To get the best out of Samuelsen, he needs the ball at his feet. Following his last couple of loans, some have said that he is too ‘lightweight’ for the Premier League. They said exactly the same about Yossi Benayoun and Manuel Lanzini. Some would say the same about Lionel Messi. However, you can have all the talent in the world but as in life, when given chances in football you have got to take them. Some will point out, that Samuelsen’s loans at Blackburn Rovers and Peterborough have not been very successful, which can be for a variety of reasons though. The style of football a club plays, may not be suitable for the way a player plays his game. A sudden change of manager, a club in financial turmoil, unrest in a dressing room .When placing a player on loan, a club must be very careful who they send a player out on loan too. Especially someone like Samuelsen, who is obviously a confidence player. What Grant McCann, the Peterborough manager was up to, when going public and saying: “Martin Samuelsen has lost all confidence “God only knows! It’s a manager’s job to give a player confidence! So where to now for Martin Samuelsen? Well it’s the first time in three seasons, that The Club will be able to have a proper pre-season. At some point Samuelsen, will get a chance in pre-season to impress the manager. He has got to take those chances, talent wise he is one of the best at The Club. So there is absolutely no reason why he should not make his mark. Having just turned 20, Samuelsen has to be in and around the first team squad. I do not think sending him out on another loan at 20 is the answer. The Club needs to take a leaf out of Southampton Football Club’s books as far as bringing on the youth is concerned. They don’t send their youngsters out on loan after loan, 16, 17, 18.They are given first team opportunities, and kept working with the first team squad. Giving them the chance to develop a first team mentality. One or two bad games? Discard them? Not on your life! It’s about helping a footballer mature as an adult and footballer. That is one of the reason why the South Coast Club has made millions from transfers. Who knows if we had kept Martin Samuelsen in the first team squad last season, we would not have spent millions on the likes of Robert Snodgrass. 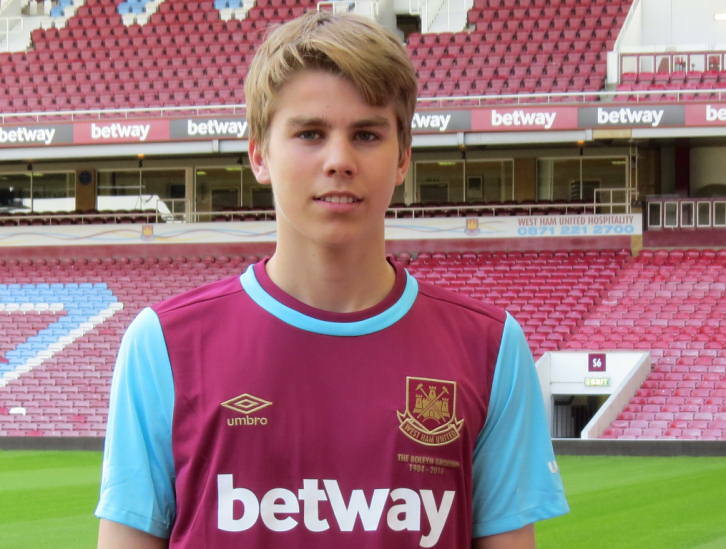 It’s make or break time this season for Martin Samuelsen, For West Ham and Martin Samuelsen’s sake, I hope he not only grasp his chances, but lights up The London Stadium. Shine Martin …shine. We are more than a football club, we’re a way of life! COYI! !